Join Alderman Deb Mell for a presentation by noted artist Santiago x on his vision for the project. 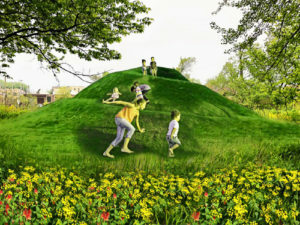 Chicago Public Art Group is proposing the installation of an earthen mound near the Chicago River at the southern end of Horner Park. 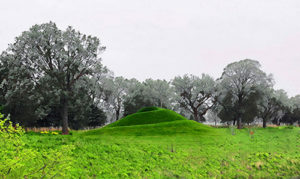 The earthwork will be the first noted installation of an effigy mound by an Indigenous Artist in North America, since the founding of the United States. This significant homage to the ancestral practice of mound building serves to educate the public about the rich cultural history of placemaking, intending to activate the human connection to the river and its importance to the narrative of Chicago’s cultivation as a city. This public art project will be a full-size replica of the Native American mounds that once lined the inland waterways and savannas before the arrival of the European settlers. It will be constructed of natural materials and covered with prairie grass and native plantings. A mulch-covered pathway will wind up to the top of the structure and allow park patrons a vista of the park and the river. 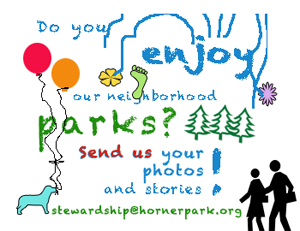 It will be integrated into the native prairie restoration area currently under construction along Irving Park Avenue. It’s location will mark the junction of two trails: the eastern end of the planned “Northwest Portage Walking Museum Trail” heading west along Irving Park Avenue and the “3, 1, 2 River Run” Trail under construction along the Chicago River. Please join us next Thursday for an in depth look at this exciting new addition to Chicago’s venerable collection of public art. A more detailed explanation of the project is located here.